Ventura seems to have turned her AIS transceiver off – ever since arriving at the B+V dry dock she’s been visible on AIS, apparently marooned in the middle of the dock area. (Viewing the AIS results using ‘Satellite’ rather than ‘Map’ has been revealing the existence of the drydock in which she’s been berthed.) But this morning there was no sign of her on AIS. A quick check of the webcam showed her still there, however – the image above was grabbed at about 7 o’clock this morning. I’ve been trying to work out when she’ll be leaving Hamburg. Her next cruise starts on Sunday – 7 April – and passengers will need to be boarding by midday. In order to not clog up the passenger embarkation, any stores, etc, that are needed will have to be loaded before that. (At least there won’t be any passengers to disembark at the same time). All this points to an arrival into Southampton early on Sunday morning at the latest, earlier if they can manage it I would have thought. I think it’s at least a 24-hour passage from the centre of Hamburg to a berth at Southampton, so that would mean being out of dry dock by very early Saturday at the latest. In fact, it will probably need to be earlier than that – Ventura will need to be in the water for her lifeboats and tenders to be re-loaded (they were unloaded while she was still berthed by the Hamburg cruise terminal). 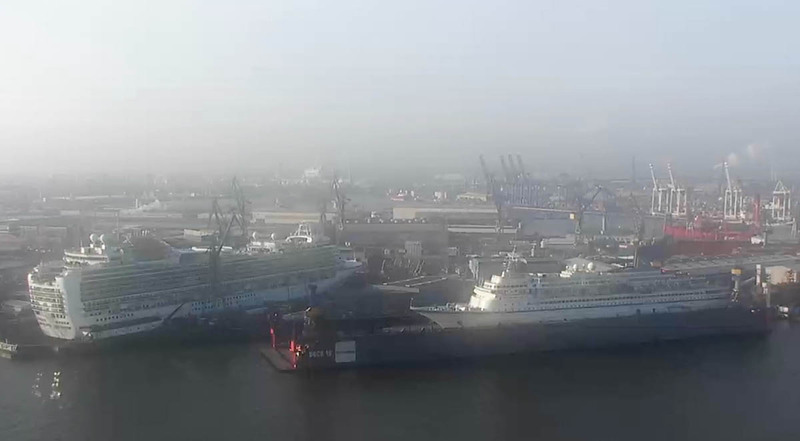 I can’t help thinking that this operation would go better in daylight, so that points to her leaving dry dock sometime during Friday daytime, with departure from Hamburg any time after that. Yesterday Southampton ship movements was showing Ventura arriving tomorrow (Friday) at 06.30 and departing 18.30 at dock 46, Re-arriving on Sunday at 06.30. Today Southampton now shows Ventura arriving on Saturday at 06.00 from Hamburg (again dock 46) so presumably it will be leaving Hamburg sometime today or early tomorrow to arrive by Saturday. How do you view satellite images of Ventura in Hamburg? Thanks for the comment and the information about the changing Southampton timings. Thanks for the update – sorry about your spoiled date. Glad it’s all on schedule, we are looking forward to boarding on Sunday!